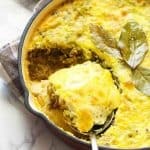 Bobotie – hearty and comforting South African dish made primarily of curried minced meat topped with milk and egg mixture and baked to perfection. Easy, tasty dish with punchy yet on point flavors! Let me make a shout out to one of our Facebook readers for suggesting this fabulous dish that the whole family would enjoy. It’s been on my list since last year’s holiday and finally it’s officially on the blog now. Wohoo! As cute as the name sounds, this dish here isn’t pure cutesy cute at all; it’s a big time dish and is often considered to be South Africa’s national dish. 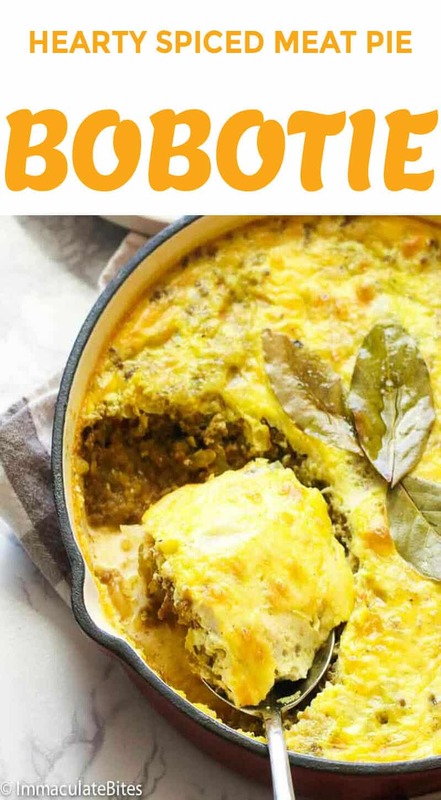 Bobotie, pronounced as BA-BOOR-TEA, appears to be a dish accounted way back the ancient Roman times (yep, imagine those thigh-high Roman sandals). It was basically layers of cooked meat with pine nuts seasoned with pepper, celery seeds and asafoetida (a herb similar to that of leeks), then added with a top layer of egg and milk mixture. Today, Bobotie recipe has been simplified by using curry powder and would usually calls for chopped onions and almonds. Traditionally, bobotie is added with dried fruits like raisins or sultanas and often garnished with walnuts, chutney and bananas. This dish is jam packed with complex flavors and textures that’s guaranteed to excite and satisfy your palate. 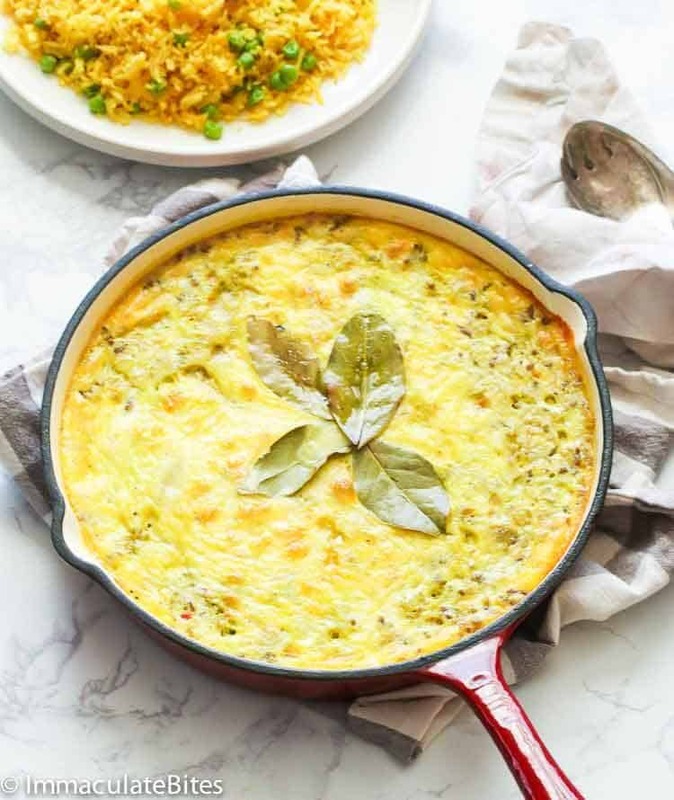 Yellow rice is often quite the perfect company for this baked dish. Bobotie is somehow associated with Meatloaf due to its similar cooking method. It starts off by sauteing the minced meat along with the spices and veggies, then finishes off in the oven. The sauteed savory minced meat complement well with the custardy milky toppings. Although not too spicy, this version of bobotie here has some kick in it. Instead of adding dried fruits, I use my mango chutney to add a hint of sweetness and kick into it. Bobotie is traditionally served with yellow rice, then some would add slices of banana on the side, chutney or some pickle. Some would serve roasted butternut squash, toasted coconut and peas. I had mine some slices of carrots on the side and yellow rice. But not matter what you serve it with, the star of this meal would always be bobotie. You can even eat it on its own! It’s sooo damn good that you’d forget the rest. 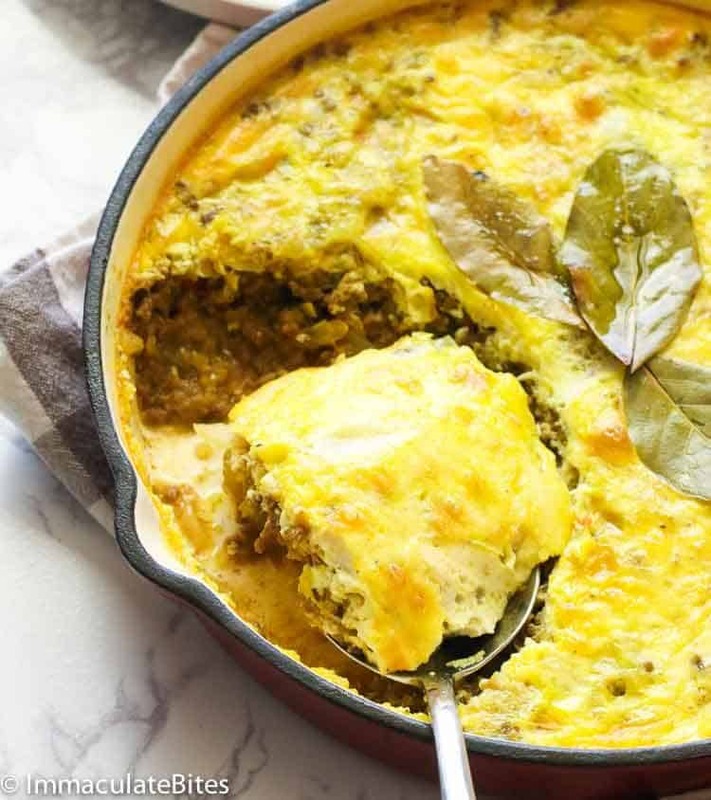 Make sure you have someone with you when eating this bobotie dish. Or you’ll regret eating the whole pan. Blame it on all its marvelous flavours! You can also serve this, too, on special occasions and holidays. You can make the curried minced ahead of time. Let it cool down first before transferring to an airtight container and into the fridge. 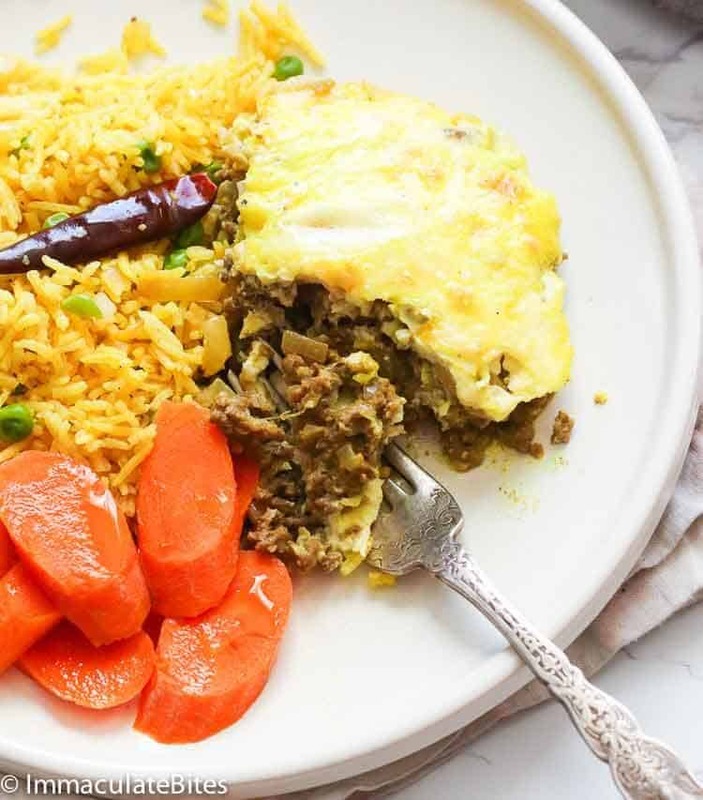 Aside from yellow rice, you can serve this bobotie with crusty bread or chapatis. Pre-heat oven at 350 deg F/180 deg Celsius. In a medium bowl, mix together milk and bread to soften it. Set aside. 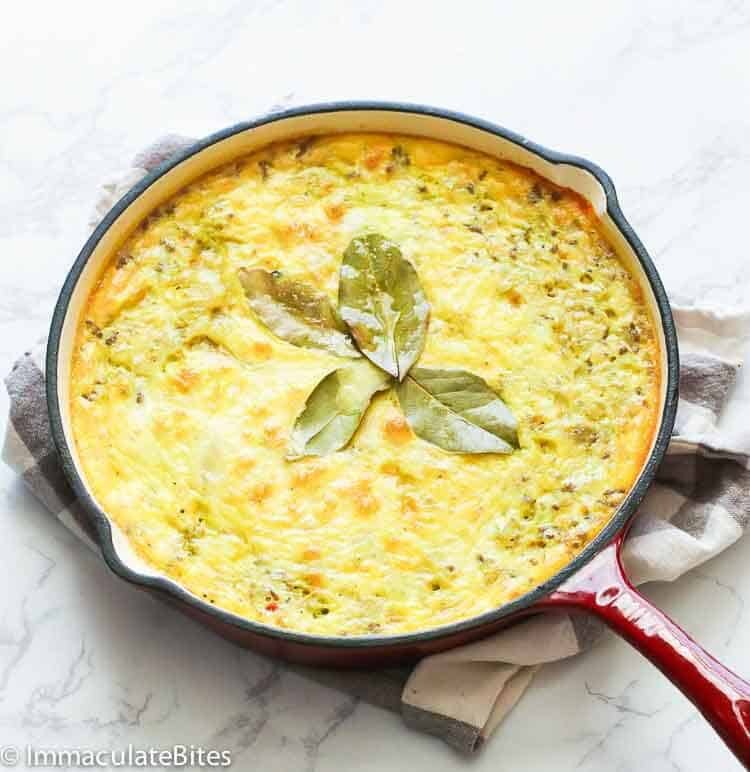 Lightly grease a 9×13-inch baking dish, or a cast iron. Heat up a large saucepan or large skillet over medium heat,then add butter until melted, followed by onions and garlic. Saute for about 3 minutes just until soft and fragrant. Next stir in the spices: curry powder, turmeric, ground cumin, coriander and dried herbs. Add ground beef and herbs stirring constantly to break it up, cook until beef is no longer pink or slightly brown. Remove from the stove. Add to a bowl, followed by bread mixture, chutney, grated apple, lemon juice and zest, and Worcestershire – add raisins here, if desired. Season to taste with salt and pepper. Bake in the oven for around 40-50 minutes. While bobotie is baking, mix together eggs, cream , milk and a ¼ teaspoon of turmeric . Take the meat out of the oven, pour the eggs mixture over the beef. Arrange the bay leaves on top of it . Bake for another 20 minutes (start checking after 15 minutes ) or until the eggs mixture has set. Remove and let it rest for a few minutes then serve with yellow rice and vegetables. Add to a bowl, followed by bread mixture ,chutney, grated apple, lemon juice and zest, and Worcestershire – add raisins here, if desired. Season to taste with salt and pepper. Add beef mixture into greased casserole dish or cast iron pan. I used a 10 inch pan. Using a spoon, press the beef mixture down. This helps keep the eggs mixture afloat and forms a nice custardy top when baked. Bake in the oven for around 40-50 minutes. While bobotie is baking, mix together eggs, cream , milk and a ¼ teaspoon of turmeric. Take the meat out of the oven, pour the eggs mixture over the beef. Arrange the bay leaves on top of it. Bake for another 20 minutes (start checking after 15 minutes ) or until the eggs mixture has set. Remove and let it rest for a few minutes then serve with yellow rice and vegetables. I spent my teenage years in West Africa (and still dream of the food) and later as an adult spent 3 years in central and South Africa and I cannot tell you HOW EXCITED I AM TO HAVE FOUND YOUR RECIPES!!! I just told my daughters I was making a milktart this week, and reading all the rave reviews I will follow your recipe to the T! Welcome aboard, Sara! 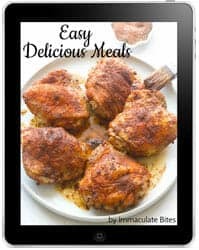 I’m excited for you to try my recipes here. Enjoy! What do you do with the bread you soaked in milk at the beginning??? Yes, you can use do half of the recipe. Just adjust the serving size in the recipe box for the ingredient amounts to be updated. I love a good base for my bobotie to help keep the egg mixture afloat and forms a nice custardy top when baked.